I was particularly happy with the timeliness of issue #249, now available online. The George Schneeman cover felt really perfect for election season. Contents include Marcella Durand on Paul Blackburn and an interview with Anselm Berrigan about his book of Newsletter interviews, What Is Poetry? (Just Kidding, I Know You Know). 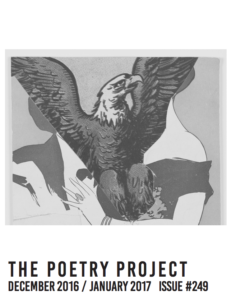 Poetry from Ari Banias and reviews: John Godfrey on Anselm Hollo; Sara Jane Stoner on Solmaz Sharif; Zoë Bodzas on Bhanu Khapil; Yanyi Luo on Safiya Sinclair; Adjua Gargi Nzinga Greaves on Metta Sáma; Matt Longabucco on Alejandra Pizarnik (transl. Yvette Siegert).